Over a decade ago, I lived near a zoo that had a unique lion enclosure. As I recall, it was one of the good and responsible zoos that gave the lions a great deal of roaming space. It also had a small section where the only thing separating the lions from its human viewers was a thick fence that stood about 15 feet high. The mere possibility of being that close to a lion (sans danger) made it my favorite exhibit. Sadly, out of the numerous times I visited, I had never seen a lion get anywhere close to that area of the fence. But that changed during one visit. On one summer day, I went to that zoo with a small group of friends. When we made it to the lion exhibit, we all stood in front of the fence and were fortunate to see a male lion walking by. He was still roughly 30 feet away from the fence, but it was as close as I had ever gotten to one of the big cats before. Next to me stood a boy who looked to be about ten years old. This kid possessed a face full of mischief and a handful of the small food pellets that were used at the petting zoo. Now, before I say what happened next, I want to stress that I do not condone this kind of behavior. With that being said, I couldn’t help being impressed at this kid’s odds-defying aim. The boy took just one of the tic-tac sized food pellets and launched it over the fence. It hit the lion – I kid you not – square in-between the eyes. I might be guilty of anthropomorphizing the great panthera leo, but I could have sworn that the lion gave him a face of shock and annoyance as if to say, “Hey, what gives, little man?” I don’t know what kind of look the kid gave in return, but all of a sudden, the lion’s look of moderate irritation turned into one of pure anger. The lion ran at the fence, stopped just inches away from it, and let out the loudest, earth-shattering roar I had ever heard. The fundamental nature of a lion’s roar is one of terror. It can be heard up to five miles away and is often used to warn and scare away would be intruders. In other words, when a lion roars, it is often saying, “Yo, I’m terrifying. You should be scared. Don’t mess with me.” And almost every creature on God’s green earth has a built in mechanism that hears scary stuff and warns, “Hey that thing over there sounds terrifying. We should be scared. Let’s not mess with it.” It’s a simple, yet genius method of communication that’s been around since time immemorial. We’re all designed at some level to avoid the scary stuff in life. But when you take the actual danger out of dangerous situations, the things that cause fear can suddenly become the things the evoke joy and exhilaration. I don’t know anyone who wants to jump off a building and fall to his or her death. However, I know several people who love roller coasters and skydiving. Take away the death aspect and suddenly the act of falling becomes wonderful. It’s the same way with the lion’s roar – it’s terrifying when it can eat you, but it’s majestic when it can’t. It’s also same with the art of writing. As any writer knows, our craft can cause an abundancy of fear. The roar of taking the gray matter of our souls and shaping it into words can be louder and more ferocious than the roar of any lion that’s ever existed. And when we decide to travel that arduous path whereby we try to find agents and publishers who will make our words accessible to the world – well, that’s when the real terror begins. But here’s the one the I want to stress to you, fellow writer: YOU ARE SAFE. Your worth is in so much more than whether or not you’ve been published. You are more than the sum of your blog readers, your Twitter followers, the word count of your struggling manuscript. You are not defined by the rejections of any agent or publisher on the planet. And if anyone shames or discourages you on your journey, there is no law in the known universe that requires you to pick up the negativity that others are throwing down. You are worthy and beautiful – if for no other reason than because you exist. The fear that comes with writing is nothing more than a lion behind an impenetrable fence. Sure, its roars may be terrible, but it can’t get you. Once you’ve truly realized that, the terror becomes something else entirely. Once you’ve realized that there’s no bone-crushing conclusion to this fall, you’ll suddenly realize that you haven’t been falling, but that you’ve been flying this whole time. Have you been terrified about any part of the writing/editing/querying/publishing process? Good! Use it. Lean in and let the lion roar directly into your face. He can’t hurt you; he can only inspire you. A few weeks ago, my wife and I bought all the stock at a local Target – at least that’s what it felt like. We don’t typically go to Target and buy massive amounts at one time, so we don’t have that mystical, innate quality of knowing which lines and checkers are the most efficient. By the way, by what strange alchemy or ancestral power do some people just know which lane will get them out the door the fastest? Do they look for signs in the fluorescent lightbulbs? Is there some secret equation that involves the placement of the gum in relation to the tabloids – the ones that are always reporting on some new royal baby or wedding that I care absolutely nothing about? We packed our cart full of groceries, supplies for vacation, and stuff we ultimately didn’t need and budged it towards the front of the store. We picked the shortest checkout line – a choice that seems to be a mistake more often than not – and patiently waited for our turn like good civilized people. And when it was our turn to checkout, that’s when we met Cheryl. Cheryl looked as if she was one cartload away from ripping off her nametag and ragequitting on the spot. She didn’t look angry with customers, but rather, she possessed the look of a tormented soul who had frequent nightmares about laundry detergent and frozen dinners and off-brand tennis shoes that fall apart after a month of use. I greeted her in my usual tones of obnoxious extroversion; she replied with a “hello” that sounded like the noise one first makes in the morning when drool has fused one’s face to a pillow. With that being said, on this day, Cheryl was slow – the kind of slow where Father Time takes a smoke break and causes all of reality to just creep by for fifteen minutes. She also had a unique way of bagging goods. Even though she had three bagging stations around her, she was very meticulous about what went into each bag. One of the first items she scanned was a plastic box of Tide pods, which went into the bag closest to her. There was still more space in this bag and she kept it open, but she didn’t put anything else in this bag until the very end. This odd bagging tactic only gave her two bagging stations to work with, and she was meticulous about these as well. Every finished bag she handed to me had goods stuffed in them like a perfect Jenga tower. But all the items that didn’t quite fit her system – and there were many – were scanned then pushed to the side of the conveyor belt. This caused her to scan a couple of things twice. Amy, who rightfully began watching her like a hawk, caught one of these errors and pointed it out. Initially, Cheryl denied the allegation in a way that made her sound as if she thought her revolutionary way of bagging was infallible. But when Amy showed her the duplicate entry, Cheryl tried to delete it, but then deleted the wrong item. Then, Cheryl proceeded to rummage through her already scanned items to find the one she accidently took off the screen. She eventually found the item, but only after Father Time had started on his second cigarette. I started to clinch my jaw in frustration. I looked back and saw that the line of shoppers behind us had grown so long that the tail end of the metaphorical snake was close to the women’s clothing department. That’s the danger zone of retail. When lines get that long, it’s an indication that the employees are losing control, and that a civilized brick-and-mortar store can suddenly turn into a lawless, post-apocalyptic scenario rife with looting and rioting. I began to feel guilty about it, even though I had done nothing wrong, even though it was beyond my control. I’m sure you’ve been there – the times where you’re the head of the queue and the retail process suddenly breaks down, and you take on the shame for being the harbinger of a ruined shopping experience. I call the phenomenon, McDonald’s Drive-Thru Guilt. I think the Catholics just call that Catholic Guilt, although my example is much more specific. But the thing that annoyed me the most was the box of Tide pods sitting inefficiently by its lonesome. Now, maybe Target has some overblown safeguards about what can go into a shopping bag with Tide pods since a handful of the world’s brightest teenagers found them to be delicious. But if that’s the case, then put them in a bag by themselves, slap a Mr. Yuk sticker on it, and move on. I thought about grabbing the bag anyway, but Cheryl occasionally looked in it to see if the item she had just scanned would be a good fit. I think that if I had snatched the Tide without her consent, it would have wrecked her whole process, and God only knows what would have ensued. I’m a pretty chill guy, but the whole process made me want to grind my teeth into dust. I could almost hear the lecture and invoice from my dentist, which made me want to grind them even more. But then, something magical happened, and I suddenly went from angry to delighted. On this day, The Storyteller whispered into my ear, “This will make for a great story. It’s like an episode of Seinfeld.” When this happened, I mentally put myself in my very own Seinfeld episode. I could almost hear the slap bass and the canned laughter as the whole rage-inducing event suddenly became hilarious. Before, whenever I looked at the bag with the Tide pods, my internal chatter would scream, “Dang it, Cheryl, just put something else in the bag!” But when my inner monologue suddenly possessed the voice of Jerry Seinfeld, it said the same words, but the context had completely changed. The bag was now nothing more than a prop in a funny skit. Dang it, Cheryl! I’m not going to eat the Tide pods! Put something else in the baaaaaaaaag! When we finally got out to our car, I laughed myself to tears as I did my best Seinfeld impersonation. Amy caught on and we talked and laughed about the whole matter the entire ride home. Thanks to my second favorite Jerry (my Dad claims the first spot), our frowns were turned upside-down. Admittedly, it’s a stupid platitude, but it works in this case. And so, at the risk of some sort of infringement, I’m coining the term Seinfelding. Whenever you’re in any kind of frustrating situation, try to listen for the slap bass, the canned laughter, and the voice of everyone’s favorite New Yorker from the 1990s. You just might feel better, and you might have a story to tell. I’ve always had a complicated relationship with blogging. In 2002, I started a website called joshuasphilosophy.com where I posted my random, often silly musings about life. I was in college at the time and although it was a creative outlet, its ultimate purpose was to impress a girl. This was before the term “blogging” became mainstream. It was also before the word “friendzoning” was invented. Curiously, Joshuasphilosophy was an experience in both terms. I like to think of myself as a trendsetter. In 2010, I started a blog called fourfingerculture.com where I wrote about religion, morality, and culture. On this site, I wrote on a fairly consistent basis for two years before I began to neglect it. This was during a time when theology and religion blogs were popping up faster than acne on an oily teenager. I eventually felt like I was simply adding to the noise, so to speak, and got tired of poking proverbial bears that did not wished to be poked. After fourfingerculture, life began to get a bit rough and my writing slowed to a freezing crawl. I feel that I’m atypical in the sense that I write best when I’m at my happiest. Unlike many writers who, at the lowest times of their life, can use their pain to dance brilliantly with words, I go into a survival mode that renders my brain incapable of any creativity beyond crafting mediocre jokes. As a result, I lived a couple of years where the only creative outlet for which I was engaged was some really terrible amateur stand-up comedy. But then – and this isn’t a cliché, but a fundamental truth about how God typically operates – the overwhelming, never-ending, reckless, (dare I say scandalous) love, grace, and healing of God rescued me at the point at which I was most broken. It took some time for my mind to heal, but the creative muse eventually came back to me like a long-lost daughter. In 2016, I started my master’s degree in theology. 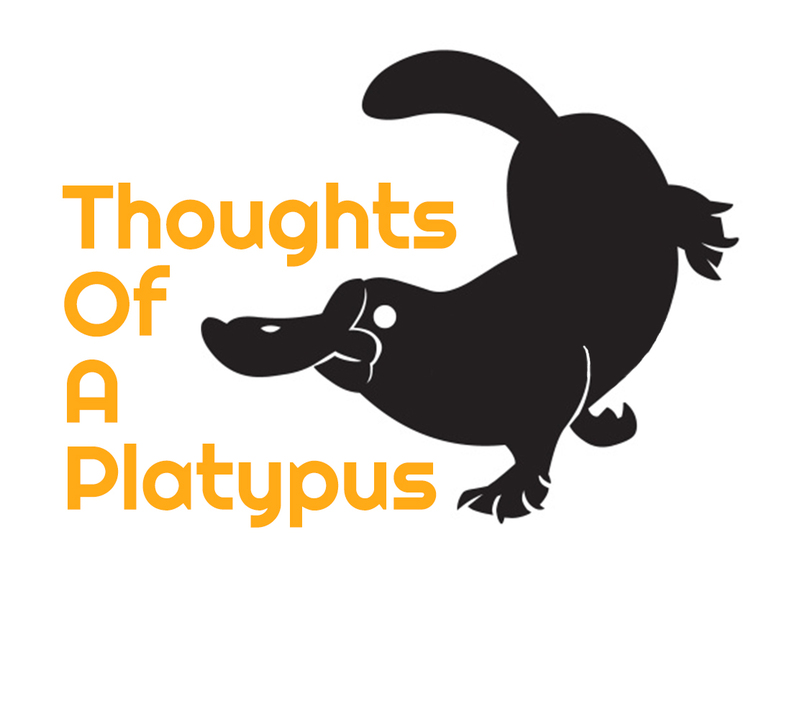 In 2017, I started my new blog: thoughtsofaplatypus.com. In my humble opinion, the blog started off well. One of my first articles found its way to Twitter and was read over 600 times in the span of a few days. Granted, 600 may not be a number worth bragging about to one’s momma, but when momma is one of the only people who reads your stuff, 600 is a pretty big deal. But three months later I started writing my first novel, and my new blog became yet another orphan. I submit that my reasons for doing so, while not inerrant, are at least understandable. First, I was attempting to write a novel while finishing a master’s in theology. Some things had to be sacrificed – things like sleep and blogging. Second, my book is a work of contemporary fantasy. Authors of such a genre aren’t found engaging on social media and blogging about their everyday life; they’re found alone in dark cellars, sipping absinthe and creating worlds on ancient typewriters in the dim glow of unscented candles. Because that’s how aspiring authors get published, right? Of course, I’m exaggerating. Nevertheless, my expectations were somewhat dashed once I heard what professionals had to say. A couple weeks ago, I attended the Northwestern Christian Writers Conference. There, I heard the same advice from several different pros: writers must market themselves and build a platform. Then, I kept hearing that little four-letter word: blog. It took me a few days to realize that I was looking at this advice through a myopic lens. There’s no objective law that states a writer must have a blog lest he or she remain unpublished. In a similar vein, the chances of being published are not necessarily contingent upon the size of one’s platform. But having a blog can help the writer network with others, gain exposure, and get the attention of those in the business. It seems like a much more effective tool than screaming at literary agents a la unshaven cave troll. But more important, I suspect that the professionals who told me to blog were being wonderfully sneaky. They, too, are writers who understand the paradoxical relationship between the wordsmith and their craft. There is little that writers love more than to write, and yet, they often need a ton of motivation to do so. So now, when I think about their advice, I also imagine that they were tacitly saying, “You’ve finished your book; don’t stop there! You love writing, and you need to keep at it if only for the simple fact that it’s in your DNA. Being encouraged to blog is similar to when my parents encouraged me to eat broccoli as a kid. They told me it would help me grow big and strong. Of course, they didn’t mean that not eating broccoli would have the opposite effect. My overall health was not contingent upon whether or not I ate broccoli, but then again, it was better for me than eating a fistful of Cheetos. Alleged health benefits aside, trying the broccoli was the right move, if only for the simple fact that I might have liked it. Turns out, I was one of those weird kids who did. So here I am again, reconciling with my abandoned blogsite. I’m going to be more consistent this time. As an author who is aspiring to get published, it just makes good sense. But more important, I’m going to blog because I’m a writer, and I love to write. What is the word we should use when catastrophe becomes routine? Mansplaining For Men: Why You Should Support #metoo, Even If You Feel Legitimately Odd About It. Yesterday morning, I was quickly scrolling through my Facebook feed when my eye caught a few statuses that contained the hashtag #metoo. I didn’t really think anything of it at the time. To be honest, I’ve grown somewhat numb to hashtags and Facebook filters. It was too early in the morning to want to think about anything on social media beyond funny videos of puppies and fainting goats. But as the day went on, and the number of those hashtags kept increasing on my feed, I began to realize that those 6 little characters contained a great deal of gravitas. By evening, the sheer number of them forced me to cognitively deal with what was going on. My initial reaction wasn’t all that pretty. This is where I get brutally honest and vulnerable. Bear with me. At first, my mental response was a mixed bag of emotions. I felt sad and angry for my female friends. I also felt defensive, perhaps a bit incredulous. Something was holding me back from fully affirming the severity and legitimacy of #metoo. It was cognitive dissonance in its rawest form. I also noticed that the majority of men in my Facebook feed were being silent about what was happening. That’s when it occurred to me: A lot of guys are probably experiencing similar emotions, and they don’t know what on earth to do with them. “What am I feeling?” is a question not easily answered in the male brain, at least not typically. It’s a skill I’ve had to develop over time. So I spent a long sleepless night trying to work out all my thoughts and emotions concerning the #metoo movement. It took a good deal of wrestling with myself. In the end it was worth it, because I came to realize that my initial feelings were dead wrong. Now, I am not ashamed to say that I fully embrace this movement, and hope I can convince other guys to do the same. The rest of this post is for the guys. Ladies, you are welcome to read it, but know that some things I say might not sit well with you. It might sound like mansplaining. That’s because, in a way, it is mansplaining. I’m attempting to explain the importance of this movement in the language of men. I’m trying to be a translator. It won’t be a perfect translation, but I’m hoping it will help bring a little more understanding to something that might sound like Ancient Greek to some of us dudes. You might feel that conversations about sexual harassment and assault are important, but are skeptical of the effectiveness of any kind of hashtag movements. You might feel that this movement is too broad and ambiguous, as sexual harassment and sexual assault are two very different things. You might feel that even though you abhor sexual harassment and assault, that these kinds of movements increase outrage culture and foster an unhealthy victim mentality. You might feel bewildered, as all the guys you know respect women. You might feel that this movement fuels the hateful man-bashing narrative of radical feminism. You might believe that every good movement or ideology needs safeguards to prevent it from turning bad, and feel these types of movements do not allow for balance and caveats. You might feel that this movement just gives problems and no solutions. You might feel that these kinds of movements generalize all men, and you hate that. You might feel that by expressing any of the above concerns, you will be labeled as some hateful mansplaining misogynist. And you might feel stuck because you want to support your female allies, but don’t want to be tacitly approving of things that might cause more harm than good. If you have felt anyone of these above symptoms, your feelings are understandable. And they may be representative of some truth, but not the entire truth. This is an important distinction so I’m going to say it again. Your feelings are understandable, and may be representative of SOME truth, but not the ENTIRE truth. Let me give you an example of what I mean. Let’s pretend I told my lovely wife I will mow the grass today. I make every good effort to get it done, but in the process I twist my ankle and the lawnmower breaks down. When my wife gets home, she sees that the grass isn’t cut and becomes annoyed. This initial feeling of annoyance is completely valid and understandable, and representative of SOME truth. She’s ultimately not annoyed at the objectivity of the grass not getting cut; she’s annoyed that I didn’t do something I said I would do. But she’s no longer annoyed when I give her the entire story, because I did everything in my power to try and keep my word. Was my wife in the wrong for initially feeling annoyed? No. She had unavoidable feelings based on her incomplete perspective. It would have been wrong of me to be outraged at her annoyance because her feelings were completely understandable. Instead of getting defensive with her, I shared with her my perspective and the problem was solved. Adults who spend a little more time understanding each other spend a lot less time being unhappy when they don’t need to be. I’ll say it a third time: Your feelings are understandable, but we need to take time to see the bigger picture. In order for me to see the bigger picture, I had to realize that my perspective was very limited on a few things. Here it goes. First, my own defensiveness was based on the absurd idea that there is an ever-increasing amount of women buying into the narrative that all men are the embodiment of oppression, scum, and villainy. Whether it was intentional or not, I got this idea from the media. Bottom-feeder bloggers and financially strapped news companies love to shine a spotlight on anyone who represents the extreme and unbalanced versions of any ideology. Believing that the news reports on the status quo will invariably lead you to believe the worst about society. But the truth is, what the news tells me and the reality I experience are entirely different. Every single one of my female friends I know who posted #metoo are nowhere close to being man haters. 100% of them are intelligent, trustworthy, and respectful individuals. They’re not generalizing all men. They’re not marginalizing women who have experienced worse. They’re not trying to milk anyone for sympathy. There is no reason why I shouldn’t believe these women or think they have some sort of ulterior motive. My skepticism about the severity of sexual harassment was also based on my own limited perspective. There have been times in life when I’ve experienced what could objectively be defined as sexual harassment. These moments did not really affect me because I had the power to push back. That is, except for one time. A long time ago, I had a superior who was blatantly sexually some of my coworkers. His position of authority made me feel powerless to do something about it. The harassment wasn’t even directed at me and the situation made dread work every day. This trip down memory lane was shocking and sobering, because it made me realize that if I ever experienced direct sexual harassment while also feeling powerless to do anything about it, I’d be pretty torn up about it. My skepticism over the amount of terrible men out there, again, was based on my limited perspective. I live in a nice-guy bubble where the closest men in my life are aggressively egalitarian and take terms like honor and integrity seriously. It’s an amazing and wonderful thing. However, it also makes me sometimes forget to take off my rose-colored glasses. My skepticism over the effectiveness of this hashtag movement was completely unfounded – not that it’s my job to judge these things anyway. I’ve heard several women state that posting #metoo was the first time they’ve ever publicly acknowledged their circumstance of being sexually harassed or assaulted, and doing so felt like a weight lifted off their shoulders. Guys, if you have women in your life who have experienced these things, and have kept it bottled up due to various fears, then that seriously points to a really big problem in our society. These women aren’t increasing a culture of victimhood, they’re taking steps towards healing. And they’re showing us that the problem is more serious than we realize. Finally, my feelings over this movement offering all problems and no solutions were simply wrong. We can’t solve unless we’re aware, and my awareness has increased dramatically. It’s now not enough for me to just state that I’ll personally respect women and teach my sons to do the same. This is a problem we must solve collectively, both men and women. Maybe we should start teaching virtue along with math and science. Maybe we should start being a little less of a status-driven society and more of an honor-driven society. Maybe we should start taking seriously the words of Jesus, “Love your neighbor as yourself,” and the words of Bill and Ted, “Be excellent to each other.” I don’t know if there’ll ever be a perfect solution, but I’m optimistic that we can do better. So guys, let’s support the hell out of this movement. You may not 100% agree with everything it stands for, but the only person that will ever fully agree with you is…well…you. Sexual harassment and assault is too important to get ideologically nitpicky. Provide a listening ear to those who wish to speak. Speak out whenever sexual harassment is seen. Show support by simply saying “I believe you”.